Throughout the centuries very few individuals have ever come close to achieving the incredible level of skill and ability that Grandmaster “Iron” Kim has achieved. Grandmaster is renowned as the living icon of Traditional Moo Doe (Traditional Martial Arts). Still to this day, there are many individuals who have witnessed the incredible skills and abilities that Grandmaster has clearly demonstrated, as Grandmaster is known not to merely talk about what he is capable of but instead he clearly demonstrates his skill and ability. This follows one of the main Traditional Moo Doe principles that one should never merely talk about their abilities and achievements but instead should clearly demonstrate their abilities and achievements. As the 8th generation Oom Yung Doe grandmaster, Grandmaster “Iron” Kim has achieved the incredible treasures of strength and harmony of the body, mind and spirit. This goal of mind and body harmony has been sought by people for centuries, but many people have found incredibly difficult to achieve. Today these goals can be reached through Traditional Moo Doe training which is proven to be one of the fastest and best ways to have an excellent overall physical, mental, spiritual condition with inner peace. Grandmaster “Iron” Kim many times demonstrated the movement, strength, and superiority of the Oom Yung Doe line in both Asia and the United States. He is one of only about a dozen individuals worldwide over the last century who has achieved the ability to demonstrate a broad range of incredible skills and abilities. These demonstrations showed his incredible ability to move internal energy to any area of his body at will. Someone capable of reaching the level of Grandmaster should have accomplished between fifteen and twenty extraordinary achievements. Over the years, Grandmaster “Iron” Kim has demonstrated over fifty extraordinary achievements, some of which are noted below. These demonstrations are meant to illustrate the true strength and power necessary to be considered a true Grandmaster and necessary to teach a proper line of Traditional Moo Doe (True Martial Arts). One of the many personal achievements Grandmaster “Iron” Kim has reached is the Kyong Gong Sul Bope (flying side kick). Pictured above is Grandmaster jumping from the top of a building. A corner of the roof is visible in the lower right corner of the picture (indicated with a white arrow). Kyong Gong Sul Bope is an example of the extraordinary level of skill and ability that can be achieved through Traditional Moo Doe martial arts training, and has made Grandmaster “Iron” Kim an icon to dedicated martial artists around the world. 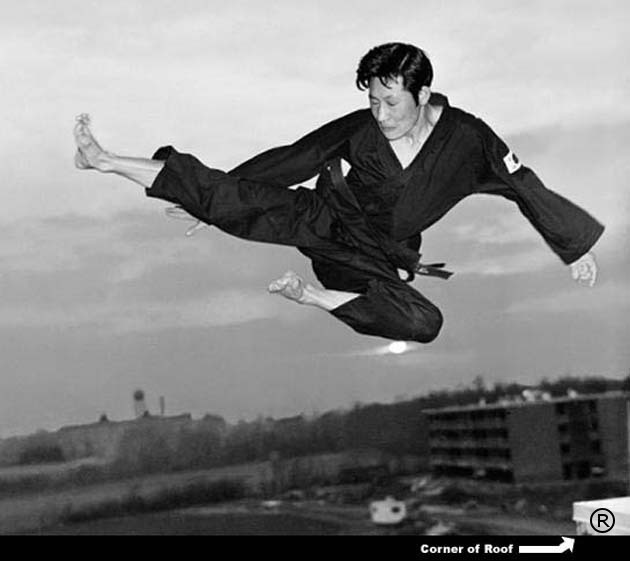 In 1970, Grandmaster “Iron” Kim demonstrated Kyong Gong Sul Bope by jumping from the equivalent of an 11-story building. In 1972 Grandmaster “Iron” Kim again demonstrated the Kyong Gong Sul Bope movement by jumping from the equivalent of an 8-story building, landing without injury on a sloped surface below. Performing the Kyong Gong Sul Bope movement is a phenomenal feat, but more important is the tremendous internal power and strength that an individual must possess in order to demonstrate Kyong Gong Sul Bope. World-wide, throughout history, only a very small number of people have been able to acheive this ability. Grandmaster “Iron” Kim is a living example of the benefits that can be achieved through the cultivation of phenomenal Moo Doe strength. Grandmaster “Iron” Kim demonstrated a flying jump side kick by jumping straight up into the air from a standing position. Once in the air he sights the opponent, decides on the method of attack, and then concentrates power to his hands and feet to carry out the attack. From this position, the body can turn in any direction (up to 360 degrees) while having complete offensive and defensive capabilities. Only someone who has the ability to combine Kyung Gong Sul Bope and Nae Gong is capable of achieving such mastery of form in movement. Through these achievements, regardless of age, miraculous strength can be attained. Grandmaster “Iron” Kim demonstrated his ability to concentrate unbelievable Nae Gong energy in the area of his stomach. Placing several rocks, totaling approximately 800 lbs., on his abdomen, an instructor then broke the rocks into small pieces by hitting full strength with a sledge hammer over the course of 15 to 20 minutes. Without the concentration of tremendous Nae Gong strength his body would have been severely injured. To exemplify the “Sang Jung” (double open hand) strike Grandmaster lined up 50 people, all leaning slightly forward. Using Nae Gong and Wae Gong combined with a strike from his open hand only 8 inches away, the whole line fell backwards and collapsed on the ground. Again using the same striking movement, Grandmaster demonstrated his miraculous control by then hitting the first man in the line and only having the 15th man in the line collapse. The other 49 people were left standing as they were having barely moved. Using Nae Gong and Wae Gong combined, Grandmaster “Iron” Kim sliced an apple into 4 pieces with a sword while the apple was in midair. Tremendous speed and timing are required to hit the exact point of the apple that is necessary to accomplish this movement. Only a few people this century have been capable of achieving this feat. To demonstrate the correct use of the “jump side kick” with Kyung Gong Sul Bope Grandmaster placed eight 6″ foam rubber cushions against the chest of an instructor. From a standing position he jumped straight up and with a powerful side kick his foot penetrated all 8 cushions. He hit a point on the instructor’s chest with sufficient energy to knock out his wind and leave him dizzy for almost an hour. Great control is required. If control is not exact extreme damage can result. In an amazing demonstration of Nae Gong strength, Grandmaster “Iron” Kim had two individuals, with a combined weight of 350 lbs., stand on his stomach while he held his body rigid, stretched out between two chairs. His head on one chair and his feet on another, he held this position without moving or bending for 30 minutes. This feat requires great strength. A collapse would be very dangerous. To demonstrate the miraculous Nae Gong energy combined with tremendous speed, Grandmaster placed a portion of tofu on top of a stack of 12 large roof tiles. With one powerful strike from his hand to the tofu, the roof tiles were shattered leaving the tofu intact. In another demonstration, a student lay on his side with three bricks under his head and one brick on top of his head. In a display of the fantastic strength of Nae Gong energy, Grandmaster “Iron” Kim explosively shattered the top brick. Nae Gong energy combined with tremendous speed, timing and control are critical as ½ ton of pressure is required to break this brick. This demonstration is very dangerous. The use of extraordinary Nae Gong energy to miraculously change the size of different parts of his body at will. Only a few people around the world are known to be capable of this feat. Using internal (Nae Gong) strength, Grandmaster “Iron” Kim pulls a van with a rope in the teeth while pulling a full size luxury car with the right hand, over 50 feet (car is off camera behind van). Grandmaster “Iron” Kim demonstrates a flying jump side kick by jumping straight up into the air from a standing position. Once in the air he sights the opponent, decides on the method of attack, and then concentrates power to his hands and feet to carry out the attack. From this position, the body can turn in any direction (up to 360 degrees) while having complete offensive and defensive capabilities. Only someone who has the ability to combine Kyung Gong Sul Bope and Nae Gong is capable of achieving such mastery of form in movement. Through these achievements, regardless of age, miraculous strength can be attained. To exemplify the “Sang Jung” (double open hand) strike Grandmaster lined up 50 people, all leaning slightly forward. Using Nae Gong and Wae Gong combined with a strike from his open hand only 8″ away, the whole line fell backwards and collapsed on the ground. Again using the same striking movement, Grandmaster demonstrated his miraculous control by then hitting the first man in the line and only having the 15th man in the line collapse. The other 49 people were left standing as they were. To demonstrate the miraculous Nae Gong energy Grandmaster placed a portion of tofu on top of a stack of 12 large roof tiles. With one powerful strike from his hand to the tofu, the roof tiles were shattered leaving the tofu intact. In another demonstration, a student lay on his side with three bricks under his head and one brick on top of his head. In a display of the fantastic strength of Nae Gong energy, Grandmaster “Iron” Kim explosively shattered the top brick. Speed, timing and control are critical as ½ ton of pressure is required to break this brick. This demonstration is very dangerous. Grandmaster has successfully trained well over 1,000 very outstanding instructors around the world.